Everyone is enjoying the day of building unity in the village. It is also a day to remember the past, and the people that came to liberate the village in 1944. 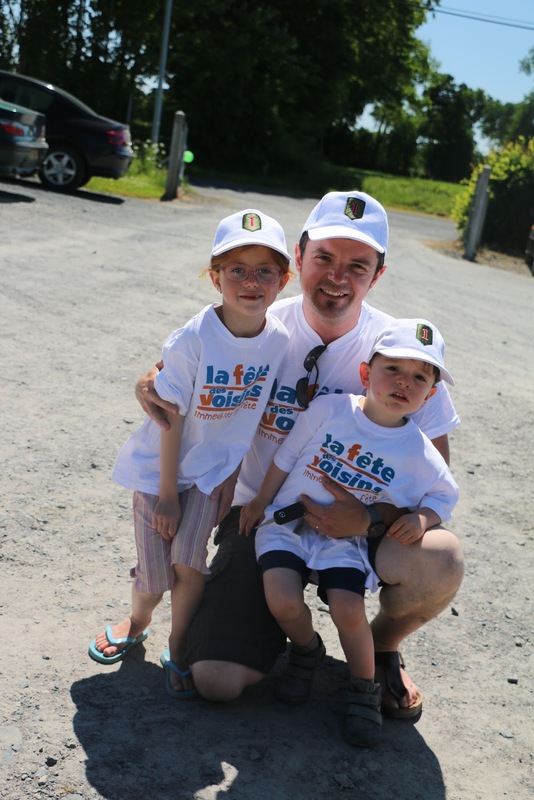 On our recent visit to Normandy, France to honor and celebrate at the 71st anniversary of D-Day, my son and I were invited to a picnic of a lifetime in the small village of Le Tronquay. The tranquil, beautiful village, spread out with winding hedgerows that encircle small fields with rows of apple trees and grazing cows is a place now I want to go back again and again in my mind. In the town centre of Le Tronquay, next to the small Gothic church, there is a plaque that honors my father-in-law, as one of it's most esteemed citizens. First Lieutenant Shumway and his platoon of men from Company B helped to liberate the small village in 1944 in the push to Paris, about ten days before he was blinded. In 1999, one French community leader in Paris promoted the initiative to have neighborly picnics and gatherings, after learning that an elderly person had died and no one knew about it until four months later. All of the 21 mayors in Paris advocated for the idea also, and it is estimated that now eight million people celebrated in their neighborhoods and villages last year in France. They call it "le fete des voisins immeubles en fete"http://lafetedesvoisins.be/en/history (in English) In 2004, the idea has spread to all of Europe, Canada, and Japan. It is traditionally held on the last Friday of May or the first Friday in June. In a modern world where we move frequently (even to other continents like me), I thought it was a brilliant idea to coalesce--to bring together people and enrich friendships in the communities we live. We all need to feel like we are linked to a tribe, community, or village, besides our own immediate family. There is a pang or wish in all of us to belong. Who can underestimate the power of a picnic? After the picnic and romping around on the soccer field, some of us went to honor my father-in-law that day. He was someone most of them did not know (a few remembered him when they initially inserted the plaque), but they understood he was an important part of their village history. They came to remember what happened in Le Tronquay 71 years ago. As we stood around the town centre that beautiful, sunny day, we listened to an American anthem while my son lovingly placed some flowers near the plaque. The French Legion leader, in a booming voice, then began singing the French national anthem, with everyone singing around me. Over 100 people from the village of Le Tronquay, France gathered together to "build neighborhoods." France has a commemorative day each year for villages and towns to come together--to grill, play games, share favorite recipes and desserts. Le Tronquay is a rural village comprised of about 780 people that is spread out. More and more of the older people are selling their farms since the younger generation usually do not choose to farm because of stiff regulations. But there are still a few brave young people who are carrying on the career of a farmer--even when they see the hardships of their parents and grandparents. Peter and I are sitting on the front row next to the mayor, Patricia. 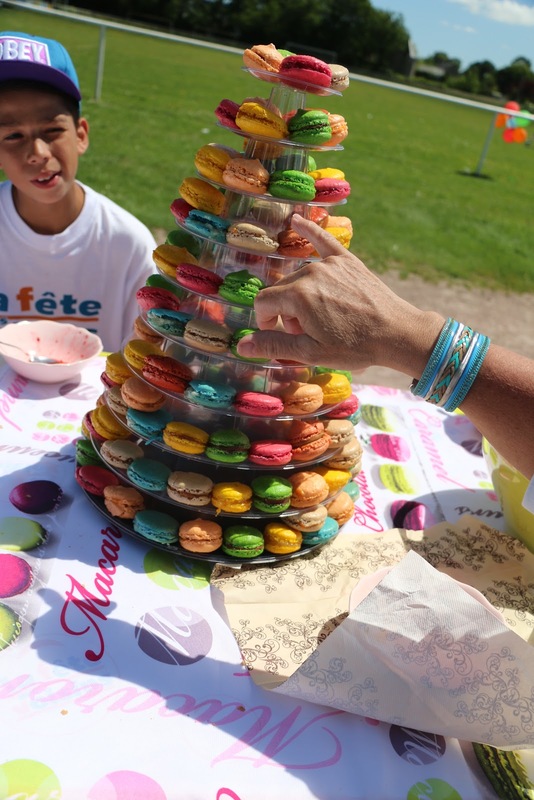 The crowning dessert of the picnic were the macaroons. I was told that they are the hardest French pastry to make. The vibrant colors and delectable taste were unforgettable. All of us were in awe of the macaroons--such a gift to all her neighbors. Another lovingly made dessert that is traditional to Normandy is called tergoule--a rice pudding that I have been told is a comfort food in France. It is slowly cooked for five hours in the oven. William, a young father, with his darling children. Lauren, the little girl, was at my side the entire time. I vowed to learn more French next time I came so I could talk to "my little friends." Here are some of the people we met that took care of us in France. Bernard, the man to the far right was 13 when the Allies came to the shores of Normandy. He is here with his wife, Collette, and his son, Jean Francoise. Mitch, a World War II documentary photographer came up from Provonce to remember the veterans. The plaque that is in the town center in Le Tronquay that honors my father-in-law. Peter putting flowers near the plaque, in remembrance of his grandfather. To the right is a memorial to the soldiers who died in World War I. Some of the villagers of Le Tronquay, as we remembered together what happened there 71 years ago. Viva le France!